Builder Online's Nigel Maynard and his posse of professional design sources offer some interesting ideas on what is IN and what is OUT in kitchens; and we don't agree with all of them. Do you? A kitchen isn’t just a kitchen anymore. Earlier this year, the National Kitchen & Bath Association (NKBA) revealed its latest standout design trends that were garnered from the association’s 2011 Design Competition. In honor of kitchen and bath month, we decided to follow up the NKBA’s effort by interviewing some top designers to see what’s hot and what’s not. Like politics, design trends are local. A moving target, they are often based on the region of the country, income levels, and the motivation for hiring a design professional in the first place. For New York City-based green designer and lifestyle expert Robin Wilson, it’s about health and the environment. Wilson, whose projects include the interiors of former-President Clinton's Harlem office and the residence of Robert F. Kennedy Jr., says middle-class families/clients aren’t asking for the same things they did three or five years ago—such as large whole-house projects with all the bells and whistles. But they are asking for bigger great rooms that encompass kitchen, family room, and media center. More flex space is a plus, and a colored accent wall is a must. White cabinets and wood floors are hot, she says, and low-flow showerheads that still offer power are also important. 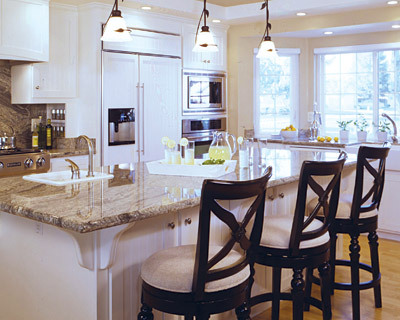 Though Gaylor does mainly renovations, her clients tend to be higher-income families or individuals who are “focused on saving money, no matter how much they have.” The designer is seeing requests for recycling centers in the cabinets, organized drawers for spices, and a strong trend for farmhouse-style sinks, even in stainless steel. “Stone tops [are hot] but not granite,” she adds. Instead, clients are asking for honed surfaces, composite quartz, and soapstone. Designer Mick De Giulio tends not to think of what materials are hot and what styles are trending when it comes to kitchens because they eventually fade and become outdated. Instead, he focuses on the needs of the clients. “I try to concentrate on lifestyle trends and how people are living,” says the principal of Chicago-based de Giulio Kitchen Design. At the moment, he says, the kitchen is king for consumers. In his kitchen spaces, de Giulio is using multiple materials for countertops, quartz surfacing, and cabinetry that will endure.